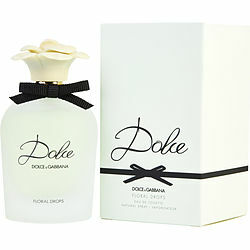 Smell fresh and lovely throughout your day when wearing Dolce & Gabbana's Dolce Floral Drops. Created in 2015 and featuring floral and fruity top notes of neroli, papaya flower and apple blended with soft base notes of sandalwood and cashmere wood, this women's fragrance offers a light yet consistent, lasting scent. Add Floral Drops to your daily beauty routine to attract just the right amount of attention and invoke a feeling of spring in the air any day of the year.